Hyderabad’s realty market has started showing green shoots of recovery post demonetisation. While multiple reformatory events acted as game changers, the infrastructure projects, particularly recently operational metro link from Nagole to Miyapur also played a crucial role. 99acres.com delves deeper to understand the impact of metro link and the key micro-markets that will benefit along the stretch. Earlier sluggish, Hyderabad real estate showcased recovery in the last quarter of 2017, albeit modest. 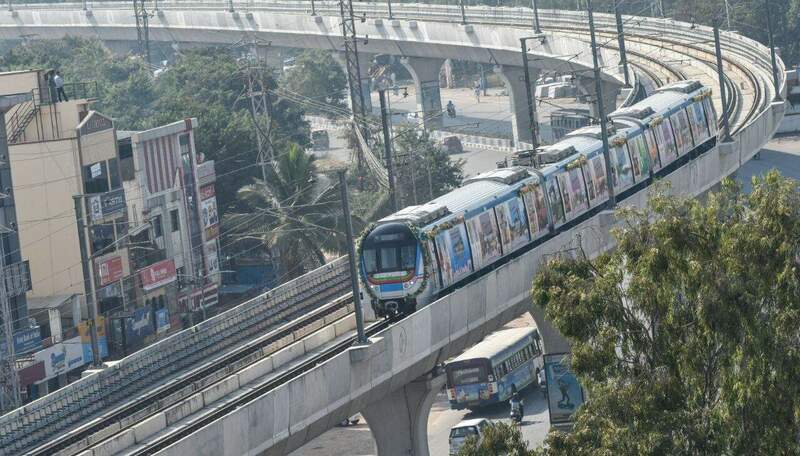 With the market acclimatising to the new norms, the city’s metro project, lately made functional for public use acted as a key benefactor for the micro-markets along the route. The 72 km metro stretch from Nagole to Miyapur revived the market sentiments in the areas abutting the route. The news of a connectivity project in the offing helped uplift sentiment, especially residential apartment owners who revised capital ‘asks’ by 3-4 percent in an anticipation of increased realty transaction in the near term. Key micro-markets that witnessed an uptrend in the capital values include Uppal, Nagole, L B Nagar Boduppal and Miyapur. Boddupal recorded a seven percent hike in average capital values QoQ. Nagole and Miyapur on the other hand witnessed 3-4 percent increase in their median prices as per 99acres.com. Banking on the improved sentiment, registration and stamp department has also anticipated a hike in the revenue collection in the areas bordering the metro route. As per reports, a consistent increase in property registrations has been recorded in the areas along the metro corridors. In 2016, close to 15000 documents were registered with Uppal sub-registrar office whereas in November 2017, the number has increased to 16000. Land values along the metro route have also reported a hike ever since the announcement of the project completion. An increase in the land capital prices have been recorded particularly in areas such as Nagole, Annaram, Bandlaguda, L B Nagar, Thatti and Boddupal. According to reports, a total of 914 were registered in L B Nagar until August 2017, however, the number rose to 990 after project completion was scheduled to November 2017. With affordable realty propositions coupled with the latest infrastructure release, Hyderabad is anticipated to regain investor and end-user interest. For instance, Miyapur, one of the busiest commercial hubs of the city is likely to witness growth. The development has not only eased the traffic woes of the residents but has also increased developer interest in the area, who refrained from foraying into the market till now. Less developed areas like Nagole and Boduppal have also been made available to serve city’s home ownership appetite. Metro accessibility to these areas has brought attention of many reputed players to these markets. With this, new launches are certain to grow in number, however, the frequency will entirely depend on the pace of absorption, shares J L Narayana, a city-based real estate agent. On the whole, market sentiments have surely improved by the metro project completion. Perturbed investors were seen treading back into the market with enquiries gaining momentum, although gradual. Rental properties also saw increased interest from tenant community, recording 5-7 percent upsurge in the residential leasing values, especially, those close to commercial nodes.